I haven’t turned this card over yet. It’s been sitting face up on my desk for a few days. I’ve had a long time to wonder about whether the close-up shot was ordered by Topps so that it would be relatively easy to doctor the card should Paciorek get traded to another team in the off-season. It seems so much like one of those doctored card shots that I had to check Tom Paciorek’s baseball-reference.com player page to make sure that he hadn’t joined the Braves in the offseason, a move that would have necessitated an inexplicably masterful changing of a previous team’s cap to the Braves cap featured here. I could have also flipped over the card to check what team he’d played for during the past season, but as I implied above, I have been experiencing quite a bit of trepidation about turning over this card to look at the back, which presumably would tell me what I learned online: that Paciorek had been with the Braves for a couple years. 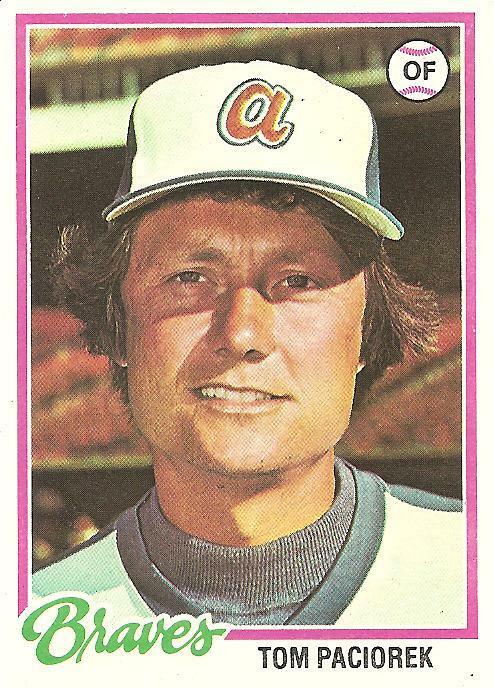 But someone at Topps seems to have anticipated that Paciorek was the kind of guy who might be moving on real soon, and in truth they only missed on this prediction by a few months, as Paciorek was released by the Braves in May of 1978. This release marked a turning point in his career. Previously, he’d been a fairly mediocre National League reserve outfielder; from that point on, however, he’d be an American Leaguer known for being a real pro as a hitter, first with the Seattle Mariners, where his improving efforts climaxed with .326 batting average and an all-star game appearance in 1981 (he singled in his only at-bat), then with the Chicago White Sox, where he logged his second and third straight season with a .300-plus batting average and helped the 1983 White Sox to the best regular season record in either league. Paciorek’s success in Chicago allowed him to put down roots that are still apparent to this day (just this weekend I heard Paciorek, who worked as a local broadcaster for quite a while after his playing days were over, on a Chicago radio station putting in the good word for one of the station’s sponsors). In all, the guy that Topps seems to have intuited as not being someone with staying power actually stuck around for 17 major league seasons. In a way, the long and steady and unspectacular career of Tom Paciorek can be seen as the polar opposite career of his older brother John, who has some renown as perhaps the greatest single-game-career player in the history of baseball: in 1963, the elder Paciorek, an 18-year-old rookie, went 3-3 with 2 walks, 3 runs scored, and 3 RBI. The perfection of the day was preserved by the inevitable imperfect twists of life: because of chronic back problems, the promising rookie never made it back to the majors. You never know what’s going to happen. Which is why I have been reluctant to turn over this 1978 Tom Paciorek card and look at the back. For some time now, I’ve been using the 1978 cards featured on my site as the playing cards in a solitaire game of the Topps back-of-the-card feature from that year, “Play Ball,” and the two imaginary teams involved in the contest, Love and Hate, have reached the ninth inning locked in a 5-5 tie. Hate, the visitor, has loaded the bases with just one out. A big hit now could bury Love. But enough stalling, I’m turning over the card . . .
There’s a good post over at Graham Womack’s Baseball Past and Present site presenting the results of a vote on the 50 best players not in the Hall of Fame. I was one of the participants in the voting, so naturally my first order of business in checking the results was to see which of “my guys” got robbed. The two that jumped out at me first for their failure to make the top 50 in the final balloting were a couple slugging switch-hitters, Reggie Smith and Ken Singleton, who featured heavily in a past Cardboard Gods conversation about underrated players. Singleton, who got on only 5 of the 63 voters top 50 lists, seems to have been particularly slighted. On the other hand, some guys that deserved not only to be high on the list of 50 but also deserve to be in the Hall of Fame, in my opinion, did rate high on the list (e.g., Raines, Blyleven, Trammell, Santo), and that was nice to see. I forgot that Paciorek initially failed with the Braves and would blossom as a reclamation project. Very Jay Johnstone-like. Never had more than 420 Ab’s, and never appeared in 130 games/season, yet he had a productive and memorable 18 year career. Paciorek has a glorious 1986 Topps card that’s just about one of my favorites. He was a late season pickup for the Mets and had a pretty good two months. I always loved the 86 Topps set, stark lettering and the classy looking black upper boarders, a nice juxtaposition to the gaudy 85 and 87 sets. Tom was pretty gray haired at that point and he’s crossing. home and is in mid-hi-five flashing a 500 watt smile. It’s a perfect moment on cardboard.